Windows 8 hasn’t just arrived—it has arrived in full force, with an armada of ancillary products. Microsoft’s deployment of the new Windows platform across desktops, laptops, tablets, hybrids, and smartphones constitutes a major push to make Windows 8 your defining computing experience regardless of your hardware persuasion. Depending on your point of view, this can be a good thing or a very, very bad thing. Let’s take a walk through some of the triumphs and failings of Microsoft’s sprawling Windows 8 ecosystem. Like it or not, this is the environment that all new-PC users (and many PC upgraders) will be working with for the next few years. Although Windows 8 stumbles in its attempts to push a touch-centric operating system onto desktops and laptops lacking finger-friendly screens, I’m nonetheless impressed by Microsoft’s execution in delivering a unified experience across all of its major consumer platforms. Windows 8 on x86-based tablets is the same Windows 8 that you can find on laptops and desktops, and this provides a tight degree of unification that’s missing from Apple’s product lineup, which is split between Mac OS and iOS. 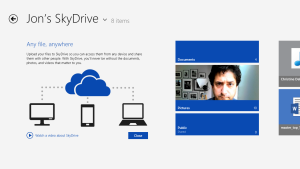 You can access SkyDrive across pretty much all your new Windows devices. The linchpin is the new Microsoft Account sign-in (formerly Live ID). Through a single username and password, your Microsoft Account taps into the cloud and establishes common preferences among all the Windows-based hardware and services you may use (though regional barriers are still a problem; more about that below). So kudos to Microsoft for acknowledging that our computers, tablets, smartphones, and game consoles should be connected, sharing a common, user-specific experience. From SkyDrive to SmartGlass to the ability to synchronize settings across environments quickly and easily, the new Windows 8 platform provides the essential core connections for all your software and gear. Since touch is the cornerstone of Windows 8—regardless of whether you actually have a touch-responsive display on your chosen device—Microsoft is pushing third-party developers to take the next big step in app creation. Simply put: Touch cannot be ignored. This mandate is an issue for people without touch-enabled hardware. And it’s bad news for people who have tried touch control but hate it. Yet Microsoft's new “the touch way or the highway” philosophy shows vision and innovation, and affirms the public’s overwhelming support for touch gestures on computing hardware. Adopting a touch-centric approach will help move Microsoft forward into the modern computing era. Sure, some developers will never jump on the touch bandwagon, either because they don’t have an interest in advancing their users' experience, or because their software can’t benefit from touch in any way (after all, some utilities are so simple, one-dimensional, or keyboard-dependent that an investment in touch development wouldn’t make sense). Nonetheless, you can expect to see many more apps that tightly and creatively leverage touch support. These are the apps that will carry Microsoft forward. And these are the apps that will ensure a consistent, high-quality user experience, regardless of which hardware you use to tap into the new Windows regime. Microsoft isn’t just reinventing its Windows platform. It’s also doubling down on a hardware strategy designed to lead by example, showing tablet manufacturers that tablet-laptop hybrids are the future of PC computing. Surface RT forces hardware partners to innovate and advance the basic computing form factor. 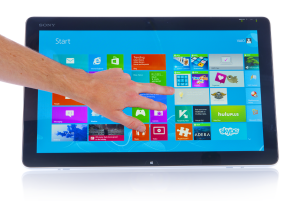 Yes, I know: Pairing touch-based tablets with keyboards isn’t a new idea. Other parties have done it before, with Asus being the most effective. But Microsoft’s elegant execution of Surface RT, with its keyboard-cover accessories, sets a high bar for what a Windows 8 tablet-laptop hybrid should be. What’s more, because Surface RT is Microsoft’s first foray into computer manufacturing, the company will now compete with its hardware partners, and this might lower prices and encourage the creation of better, more interesting, more innovative computers across the entire Windows 8 ecosystem. In essence: Consumers get more choice, and better products to pick from. Microsoft, meanwhile, achieves faster market-share gains for Windows 8. The new Surface tablet isn’t just the premier hardware component in the new Windows ecosystem—it’s actually a catalyst for greater ecosystem success. Now that Microsoft has committed to the brave new world of touch—and smartphones and tablets—it has to deliver the goods. It’s now competing directly with the iPad and iPhone. It’s now competing with scads of Android devices. This isn’t necessarily an enviable position given Microsoft’s uphill climb, but it will definitely drive innovation, and that bodes well for the Windows ecosystem as a whole. In short, Microsoft has to get very creative, very quickly. Ultimately this challenge will benefit consumers the most. Microsoft will have to drive new features throughout its platform, especially new ways for all of the hardware components to interact with one another. And this is an opportunity that neither Apple nor Google really gets to explore, since Apple splits its ecosystem between Mac OS and iOS, and Google doesn’t even have a computer OS. Apps such as Xbox SmartGlass, and services such as the SkyDrive cloud platform and Xbox Music streaming, are great starts. But what else can Microsoft do to persuade users to abandon their existing devices and ecosystems, and leap head-first into Windows 8? More important, how fast can Microsoft pull that off? These are scary questions for Microsoft, but I think standing in place doing nothing is an even scarier option. Apple had one first. Then Google got one. Now, finally, Microsoft has one too: a software store. It’s not for your Windows Phone 8 device, but for Windows itself. And the new Windows Store is the only place you can download “Windows 8 apps,” the Start screen-centric programs previously known as Metro apps. 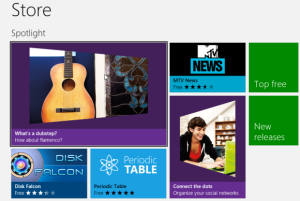 The new Windows Store ensures a reliable user experience for PC neophytes. Although the move has frustrated developers who create software that Microsoft doesn’t want—either a result of a particular app falling short of Microsoft’s guidelines, or the fact that Microsoft isn’t opening the Windows Store to the full purchase of desktop applications—it’s nonetheless a powerful driver in making Microsoft’s ecosystem more accessible, more convenient, and more secure for users. The Windows Store is a great step forward; but in order to recognize its benefits, you can’t look at it through the eyes of a power user. Envision, instead, the typical technological neophyte who wants access to online shopping, streaming movies, financial information, games, rudimentary media editing, and all the other simple services that computers make possible. Throughout their computing lives, these novices have been tempted numerous times: A Web ad has asked them to install something they shouldn’t. Or they’ve installed software upon the recommendation of a friend, but that software isn’t compatible with their system. Or, even sadder, these newbies might not even know how to find and download new programs for their PCs. The Windows Store gives such users a simple and secure entry point for downloading apps that have passed stringent certification from Microsoft itself. Sure, an app might ultimately stink, but at least users now have strong assurance that the software won’t muck up their systems. To wit: Apple’s App Store went more than five years before succumbing to its first piece of malware, and the company quickly expunged the app so that no new user could download it ever again.